We only know about Undley church because of an intriguing aside in the Domesday book. While discussing the holdings of the Abbey of St Etheldreda, the chronicler enumerates the wealth of the parish of Lakenheath, including the little hamlet of Lundale: St Aethelthryth held Lundale with 1 carucate of land and 3 bordars and 4 slaves. Then as now (ie: before the conquest) 2 ploughs in demesne and 13 acres of meadow. 2 fisheries. 1 horse, 24 head of cattle and 62 sheep. Then as now worth 20s. A church without land. It is 2 furlongs long and 2 broad. The geld is in Lakingahethe. A carucate of land was as much land as could be ploughed by a single team of oxen in a single season. This is quite a lot for only 3 peasants and 4 slaves to manage, but a big clue as to who else was living in the hamlet is that there is a church without land. This means the church had no rectory land to support a Priest, so perhaps the ministry here was provided by Ely Abbey monks, who also farmed the land. Whatever, it must have been a temporary arrangement, because no further mention is ever made of Undley church, and its dedication and exact location are unknown. 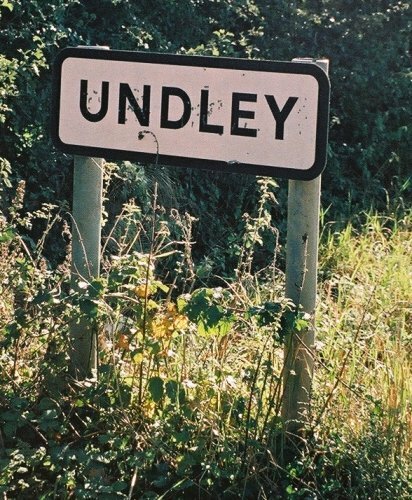 Undley sits in the fens between Lakenheath and the Cambridgeshire border. Probably few people visit it, and it would be a peaceful place if it wasn't for the fact that two American airbases sit within three miles of it. You reach it along a straight fen road from Lakenheath high street, passing Undley Common first on your left. The village is a typical fenland hamlet, very functional, along a straight dead-end road off to the right. However, this also forms the lane to Undley Hall, and the balance of probability is that the church was located somewhere near the Hall. Not that you'd ever know now. Undley church was in Undley, to the west of Lakenheath, and signposted from the southern end of the road to Eriswell. No trace survives.